Google is celebrating Children's day with a doodle envisioned by a school student from Mumbai, winner of the 2018 Doodle 4 Google competition in India. The theme this year was "What inspires me". 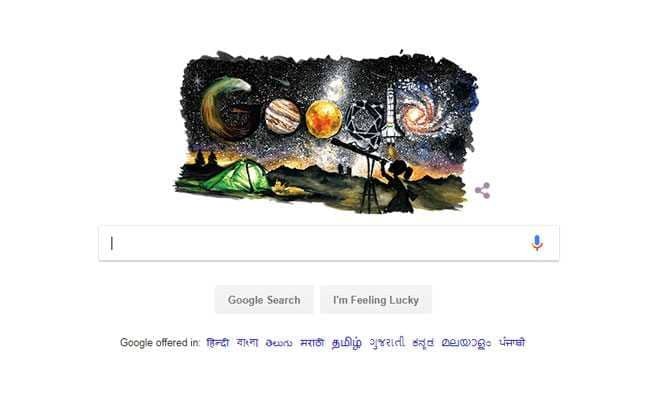 Pingla Rahul, the winner, showed her fascination with space exploration with the doodle, which shows a child looking at a sky dotted with stars with a telescope. Ms Rahul created galaxies, planets and spacecraft to represent the vastness of things in space, which are carefully arranged to form letters in the Google logo. There are four more group winners that Google chose; a doodle on farmers, animals, wise monkeys and a study desk. The winners were chosen by Arun Iyer, famous artist and YouTube Kids Creator, Rob (Harun Robert), India's leading YouTube Creator Sejal Kumar and the Google Doodles team lead, Ryan Germick, with 300,000 votes from people. In India, Children's Day is celebrated on the 14th of November in India as a tribute to Jawaharlal Nehru, who was born on November 14, 1889. Jawaharlal Nehru, fondly called Chacha Nehru was known for his love for children. On this day, chocolates and gifts are often distributed among children, while schools organize different events such as debates, and music and dance performances. Keen on education of India's children, Pandit Nehru oversaw the establishment of some of the most prominent educational institutions in India. His vision for the development of youth played a major role in the setting up of the All India Institute of Medical Sciences, or AIIMS, and the Indian Institutes of Technology. He even initiated the establishment of the Indian Institutes of Management.